Best case, BPDU guard on the physical switch blocks but doesn’t shut down the port – all VMs pinned to that link get blackholed, but the damage stops there. More often BPDU guard shuts down the physical port (the reaction of BPDU guard is vendor/switch-specific), VMs using that port get pinned to another port, and the misconfigured VM triggers BPDU guard on yet another port, until the whole vSphere host is cut off from the rest of the network. Absolutely worst case, you’re running VMware High Availability, the vSphere host triggers isolation response, and the offending VM is restarted on another host (eventually bringing down the whole cluster). There is only one good solution to this problem: implement BPDU guard on the virtual switch. Unfortunately, no virtual switch running in VMware environment implements BPDU guard. Interestingly, the same functionality would be pretty easy to implement in Xen/XenServer/KVM; either by modifying the open-source Open vSwitch or by forwarding the BPDU frames to OpenFlow controller, which would then block the offending port. Nexus 1000V seems to offer a viable alternative. It has an implicit BPDU filter (you cannot configure it) that would block the BPDUs coming from a VM, but that only hides the problem – you could still get forwarding loops if a VM bridges between two vNICs connected to the same LAN. However, you can reject forged transmits (source-MAC-based filter, a standard vSphere feature) to block bridged packets coming from a VM. According to VMware’s documentation (ESX Configuration Guide) the default setting in vSphere 4.1 and vSphere 5 is to accept forged transmits. Lacking Nexus 1000V, you can use a virtual firewall (example: vShield App) that can filter layer-2 packets based on ethertype. Yet again, you should combine that with rejection of forged transmits. In theory, an interesting approach might be to use VM-FEX. A VM using VM-FEX is connected directly to a logical interface in the upstream switch and the BPDU guard configured on that interface would shut down just the offending VM. Unfortunately, I can’t find a way to configure BPDU guard in UCS Manager. Disable BPDU guard on the physical switch. You’ve just moved the problem from access to distribution layer (if you use BPDU guard there) ... or you’ve made the whole layer-2 domain totally unstable, as any VM could cause STP topology change. Enable BPDU filter on the physical switch. Even worse – if someone actually manages to configure bridging between two vNICs (or two physical NICs in a Hyper-V host), you’re toast; BPDU filter causes the physical switch to pretend the problem doesn’t exist. Enable BPDU filter on the physical switch and reject forged transmits in vSwitch. This one protects against bridging within a VM, but not against physical server misconfiguration. If you’re absolutely utterly positive all your physical servers are vSphere hosts, you can use this approach (vSwitch has built-in loop prevention); if there’s a minimal chance someone might connect bare-metal server or a Hyper-V/XenServer host to your network, don’t even think about using BPDU filter on the physical switch. Anything else? Please describe your preferred solution in the comments! BPDU filter available in Nexus 1000V or ethertype-based filters available in virtual firewalls can stop the BPDUs within the vSphere host (and thus protect the physical links). If you combine it with forged transmit rejection, you get a solution that protects the network from almost any VM-level misconfiguration. Last but definitely not least, someone just might decide to change the settings and accept forged transmits (with potentially disastrous results) while troubleshooting a customer problem @ 2AM. You’ll find them in the VMware Networking Deep Dive webinar (buy a recording); if you’re interested in more than one webinar, consider the yearly subscription. To quote the Joker: "It simple, we kill the Spanning Tree"
Use some cheap mpls switches (so !cisco) to build a multi path routed core and run vlps/vll over that as required. Although I'm a total MPLS fan, I heartily disagree with your comment. You have no idea how much complexity you've just introduced (without solving the original problem: detecting VMs with bridged NICs). "Because the Cisco Nexus 1000V Series does not participate in Spanning Tree Protocol, it does not respond to Bridge Protocol Data Unit (BPDU) packets, nor does it generate them. BPDU packets that are received by Cisco Nexus 1000V Series Switches are dropped." The way I'm reading that (and they have a nifty diagram above) is bpdu packets are dropped and not forwarded on to the physical switch. Not sure if Kurt was running the 1000v or not...if this is the case though at the very least Cisco needs to clear this up. I must admit, I didn't think it though that much. The places where I have worked (Multi lateral IXs) took the sledge hammer approach. Filtering everything bar blessed mac addresses and etherypes. While you could pre populate blessed macs at provisioning time in a hosted VM environment. I doubt that would fly in the enterprise arena. Disclaimer: I am a Cisco SE. 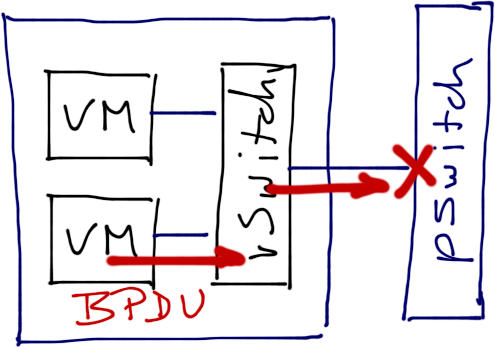 Filter BPDUs on the virtual switch, such that the VMs can't influence L2 topology. There's still the risk that VM <-> VM can loop traffic between themselves, but this is no difference than two physical servers doing the same. Exactly. If you want to actively configure bridging between two servers, be them virtual or physical, I don't think the network should prevent this from happening. This is pretty hard to achieve by accident (unlike wrongly patching switch uplinks). Network equipment should not patronize the administrator, it should protect from accidents. I would rephrase the title to "Virtual switches should prevent VMs from impacting the network topology". BPDU guard is just one way to do so. Nice to bring this into discussion though. #2 - BPDU filter @ NX1KV does not prevent forwarding loops through two VMs. While being pretty hard to configure, they could happen. The missing bit (maybe I should include that as well) is that Kurt runs an IaaS environment and has no control over stupidities his customers want to make; he has to protect his network. There is a something you can do with VM-FEX though - configure BPDU guard on Nexus 6100. Will insert that in the article. Disagree. If the server admin is stupid enough to misconfigure the server (not impossible), the network has to survive. 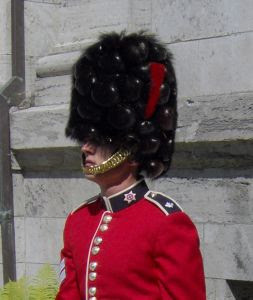 Actually, I've seen a MSCE configuring bridging between two Hyper-V interfaces in a bad-hair moment. Result: total network meltdown (yeah, BPDU guard was disabled and something probably filtered BPDUs). Would the Cisco ASA 1000V prevent this using - access-list id ethertype deny bpdu ? You could use vASA or VSG to filter BPDUs. VSG would make more sense, as it sits directly in front of vNIC (not yet sure how vASA interacts with vPath API). In both cases, BPDUs would be dropped before they would hit the physical link. You'd still need "reject forged transmits" to prevent forwarding loops. I know this is not a solution the moment it happens, but you can disable BPDU generation in this case using a Windows registry key (see http://msdn.microsoft.com/en-us/library/ee494722.aspx). Going over all possible solutions, there is nothing that will cover every possible situation. Know your environment and act accordingly? But my point was that it's a L3 loop, constrained by the uplink speed of the devices in question - far more manageable than a STP loop. Really, it's no different to a server just maxing out it's interface by pulling random data from another source on the network. Agree with you on #2. In a "what could go wrong" moment, the server admin tries to solve *some application problem* by creating a bridge/etc. It doesn't work using the NX1K port profiles so he manually goes into vCenter and goes around it. Another problem w/ the BPDU filter option is that most of the ports facing vSphere have portfast configured and receipt of a BPDU w/ BPDU filter enabled with disable portfast - something people often forget. Another thought is if you implemented BPDU guard in the vSwitch, that's also not ideal because you have prevented the use case where someone wants to bridge a VPN to a vNIC, like they have done in Ivan's example. 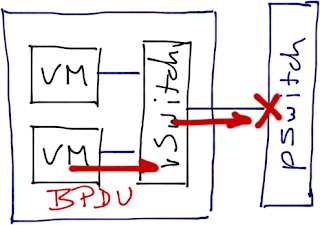 BPDU guard functionality doesn't imply just dropping the BDPUs, it also implies shutting down the virtual port of the vSwitch connected to that VM. The primary use case is that virtual machines are not Ethernet bridges, so the current implementation works well for the common use case. However, where there are advanced use cases like this where VM is a bridge running STP - the admin has to do a little more, like either disable bridge code in Windows via registry (too complex and doesn't work in Cloud environments since management can be delegated but viable in non-Cloud use cases) or use products from VMware and partners to drop the BPDUs. For example, vShield App has a L2 firewall capability - you can drop all BPDUs sent by VMs at will with a point of enforcement being on every vNIC of VMs on the ESX host. If you do that, you have to create a loopfree topology. Oh but the network does survive, as it's isolated from these mistakes through BPDU Filtering at the virtual switch. It's just the VMs themselves that will go crazy. Great rewrite on the article, by the way, offers much more visibility into the challenges and possible solutions. Kudos. #1- Public deployment guide states so: http://www.cisco.com/en/US/prod/collateral/switches/ps9441/ps9902/guide_c07-556626.html - "Because the Cisco Nexus 1000V Series does not participate in Spanning Tree Protocol, it does not respond to Bridge Protocol Data Unit (BPDU) packets, nor does it generate them. BPDU packets that are received by Cisco Nexus 1000V Series Switches are dropped." #2- That forwarding loop between VMs cannot come from the outside, as Nexus 1000v will drop local source MAC address frames on ingress. It must happen another way. #1 - confirmed by the PM. #2 - You're almost right, but for a wrong reason ;) A bridging VM would forward an externally-generated broadcast/multicast. To stop that, you have to use "reject forged transmits" to catch a flooded packet existing the VM. Ivan, with regards to your VM-FEX offer, as far as i know all interfaces on N5K/N7K and UCS-FI that considered as HIF (host interfaces) on the FEX (2K/IOM/VM-FEX) have BPDU Guard on by default and you actually can't remove it. so assuming that a logical interface on the UCS-FI (vEthernet) receives a bpdu it will err-disable that interface. By default, the N1K performs a deja vu check on packets received from uplinks, preventing any loops. I know it does a lot of loop prevention checks, including source- and destination-MAC checks. Are you implying it does more than that? I stand corrected, Ivan - user has to configure this. 6w2d: %SPANTREE-SP-2-BLOCK_BPDUGUARD: Received BPDU on port GigabitEthernet1/31 with BPDU Guard enabled. Disabling port. Then we went to the configuration show above w/ portfast enabled, filter enabled, guard disabled and the port moved from blocking to forwarding as per portfast definition and BDPU counters are at zero… The key thing is to do this on a per-port basis and not globally. Port path cost 4, Port priority 128, Port Identifier 128.31. The host can also tag a frame and the vSwitch will just forward to switch (if the vSwitch is tagging, it adds a tag). vSwitch will block double-tagged frames on ingress, but it will gladly forward them. BPDUfilter, only when enabled globally, can prevent BPDUguard from triggering if a user/customer bridges two vNICs in ESX. BPDUfiltering, enabled globally, filters outbound BPDUs on all portfast/edge ports. It also sends "a few" at link up to prevent STP race conditions and an ugly loop as a result. If it does receive BPDUs, it causes the port to fall out of portfast/edge mode. b) A miscabled host attached to a pSwitch port will fall out of portfast mode if BPDUs are seen from it. Protecting you from a bad sysadmin/cable-job with a non-loopfree (non vSwitch) looping the network. Basically, enabling BPDUfilter globally circumvents Ivan's concern in the above blog about a non-ESXi being plugged into the network causing a loop. If one of these does get plugged in and has a loop, the switch will see the BPDUs at link up and move the ports out of portfast/edge. The only situation where this breaks down is a non-ESX hypervisor that has a vswitch that does not guarantee loop-free. In this situation, the pSwitch sees the uplinks as up and online, so no BPDUs have been sent in awhile, so a loop in the non-ESX vSwitch could be a devastating take down of your datacenter. Then, I'm afraid, storm-control is your only friend. Outside of my Virtual-facing pSwitches, I would never do BPDUfilter, even globally....BPDUguard is a must for the rest of my network. What would happen if you start the bridging VM __after__ the physical links have been up for quite a while? so what happen's if we use L2 Filters on the phy port incoming to drop all bpdu packets ? ... and how will you detect a loop? You know, bridges (including the bridging functionality in Linux or Windows) use BPDUs for a good reason.